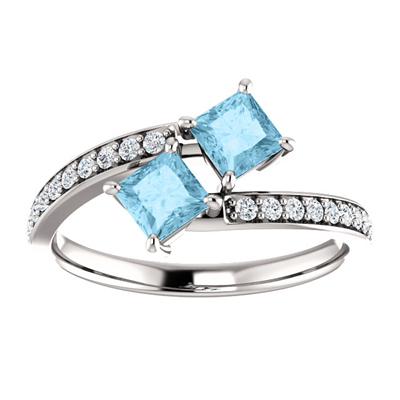 The two small aquamarine gems feature some light blue tones that blend in well with the 14k white gold body. At 4mm each, the two gems are linked together alongside a band features 19 diamond accents situated with in a secure body. This has a carat weight of 0.19 to create a better look. We guarantee our Princess Cut Two Stone Aquamarine and Diamond Ring in 14K White Gold to be high quality, authentic jewelry, as described above.